Nifty Futures opened within the range on Monday and managed to break Fridays low in the first 30min of trading and tested 10300 levels post the mid noon. Post testing below 10300 managed to recovered towards the Developing Point of Control. Trading sentiment is negative and value formed lower for the day relative to Fridays trading session. PSU Bank scam sentiment weigh the day, puts more downside pressure on the price. Call writers are active at 10400PE, 10500PE, 10600PE for this series. However price manged to close approximately around previous week low at 10374 on EOD basis with a sharp and late recovery from the day low of 10290.1 levels. 2)Prominent POC formation at 10675 on 5th Feb 2018. For Tuesdays trading rally high at 10399 is likely to serve as critical level to identify if there is any meaningful change in the market. Trading sentiment will become positive if price manages to trade above rally high and closes above rally high on EOD basis which could bring immediate target towards the mechanical reference 10615 levels. 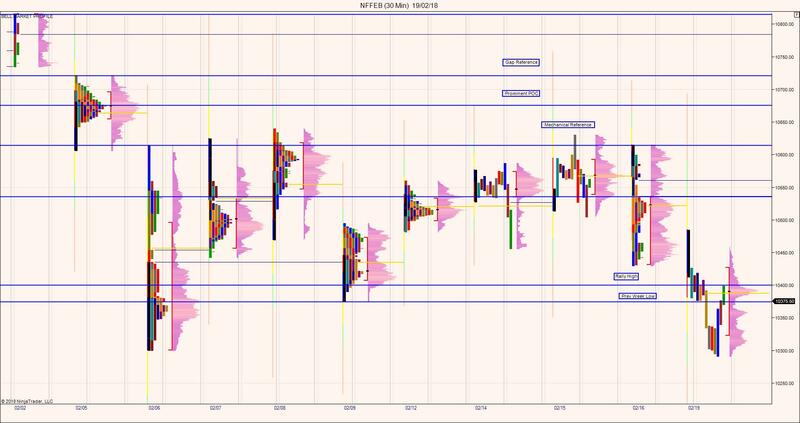 However price if failed to accept above 10399 or price rejection around 10399 will potential targets the visual reference 10110 levels on EOD timeframe.